Get yourself some wine already! You want some delicious wine, don't you? In addition to your favorite local wine retailer (be sure to ask for us by name), there are three NEW ways to buy our wine. 1. Free case delivery in the greater Seattle area. 2. Buy a 3-pack and we'll ship it to you. Our Double Gold award-winning CHardonnay (and we all know there's no gold like double gold). this is classic WASHINGTON State Cabernet Sauvignon. palate-Friendly structure with lots of dark fruit. 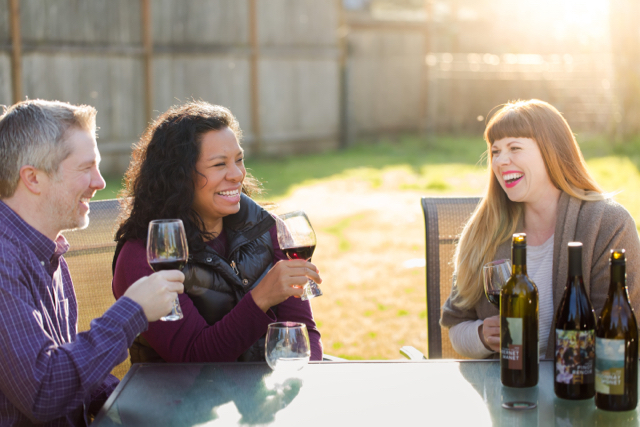 Wine Enthusiast Magazine says our Oregon Pinot Noir is "Well recommended" (glasses sold separately). Free case delivery in the greater Seattle area. Planning a party? Need wonderful gifts for people you actually like? Have some other completely legitimate reason to buy 12 bottles of wine at a time? Of course you do. So why not just have a case delivered? You'll get 4 bottles each of Chardonnay Monet, Cabernet Manet, and Pinot Renoir for only $249 (sales tax included). Order now and we'll contact you to schedule delivery. How many wineries will personally show up at your front door (but not in a creepy way)? Buy a 4-pack and we'll ship it to you. You can try (or enjoy again) our three wines without ever leaving the comfort of your own home. So if you're a shut-in, an agoraphobe, or just comfortable in your jammies right now, we'll take care of you. We'll never even ask if you shared (though we do encourage it). And it's only $99 (sales tax and shipping included). Unfortunately, this option is not available for residents of AL, DE, KY, MS, OK, UT, or RI at this time. Members receive two shipments of four wines a year for $79 per shipment (sales tax and shipping included). We ship the best of our releases in April and October and even include an exclusive surprise gift just to say "thanks." Sadly, we cannot ship to residents of AL, DE, KY, MS, OK, UT, or RI at this time. Want a custom order? We aim to please. Email us and we'll figure it out together.